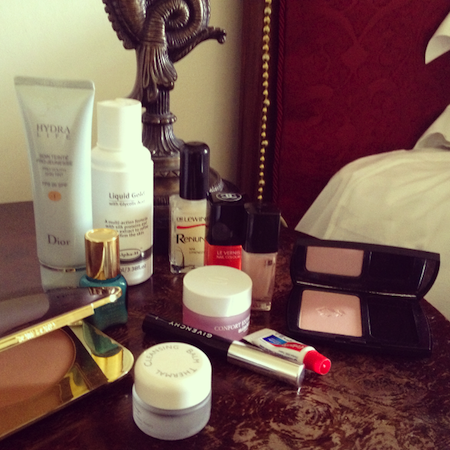 This bedside beauty snapshot was taken at Champneys Tring. You’ll see some old favourites and a couple of new things – I’ll make it snappy and link to existing reviews for the products that I’ve mentioned before! 1) Tom Ford Gold Dust Bronzer – used in a video recently, stockist link is underneath the video. 2) Dior Hydralife Tinted Moisturiser – is gorgeous. It will be reviewed separately, but for now know that this has a beautiful texture and a healthy, glowy sheen. I love it. It’s £27.25 including delivery from Escentual.com – I use shade 1. 3) Alpha-H Liquid Gold – read the main review here. I swear by this stuff, just in case you’re a new reader! 5) Omorovicza Thermal Cleansing Balm – LOVE THIS. It’s not cheap, but it’s so, so lovely. Follow with their Deep Cleansing Mask for a simple but highly effective home facial. 6) Givenchy Kohl Liner – I’m on hols and naughtily didn’t finish this post properly, so will have to add link once home! 11) Lancome Highlighting Blush – ultra pale, but gives the most flattering shimmering highlight wherever it’s brushed. Makes a softer alternative to the cream highlighter “snail trail” that adorns many a cheekbone these days! Not that there’s anything wrong with the cream highlighter (I adore them), they just need to be blended properly. This one is £27.50 with free delivery from FeelUnique.com. Mine is a pale, pale pink and in the image online it looks like a hot pink, but they have the same shade number, so…confused!